This is the first game in the Shin Megami Tensei series. 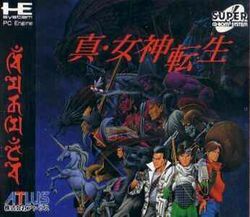 For other games in the series see the Shin Megami Tensei category. Shin Megami Tensei is an RPG set in Tokyo in the year 199X. Demons have come to earth and upset the balance of power. The hero receives a Devil Summoning program via email which allows him to converse with and recruit the demons to fight for him. This page was last edited on 9 December 2015, at 19:32.